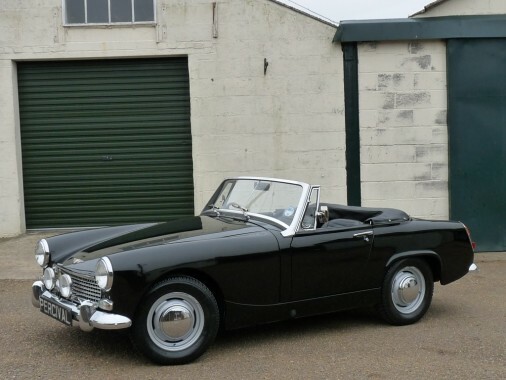 This very pretty Sprite has 53,000 miles recorded which is believed genuine. It had two owners until 2009 and was restored some years ago which included new floorpans and sills, replacement of mechanical parts where necessary and an engine rebuild. The interior was treated to new carpets, seat covers, dashboard panel and a new hood. It remains in immaculate condition. The MkIV Sprite has a 1275cc engine with twin carburettors. a four speed gearbox and a proper folding hood. This car comes with a tonneau to cover the hood when folded, front spot lights, electronic ignition and a 12V socket for sat navs. It is a hoot to drive and looks superb in black.